Over 40 land and water group fitness classes are available and FREE to JCC of Greater Buffalo FULL members and do not require additional registration or payment except where noted. Don’t wait to register! The JCC’s swim classes fill up fast! Exercising in the pool offers a fabulous aerobic, awesome cardio and strength work out experience in a low- or no-impact environment, so it is great on joints. 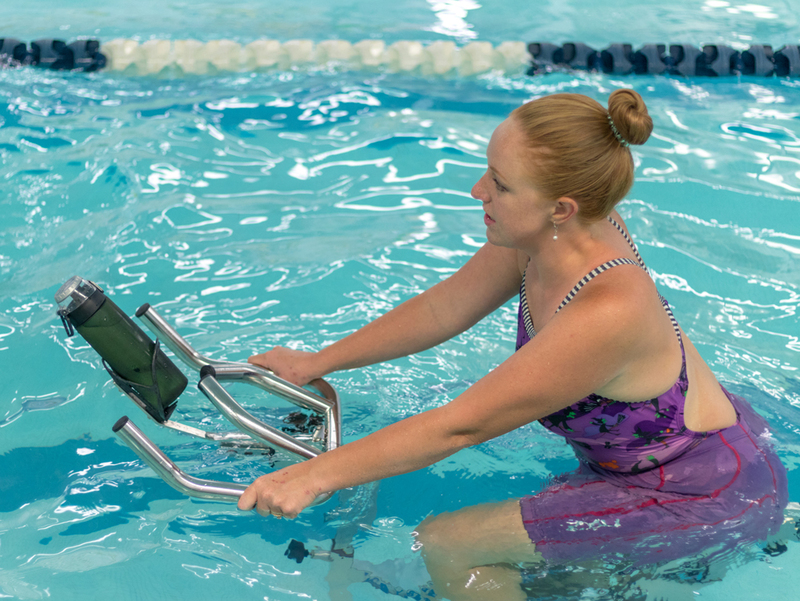 Classes vary in intensity from arthritis range of motion and flexibility classes, to traditional upbeat water aerobics, to calorie-crushing interval classes. Check out our Hydrorider Aqua Spinning Bikes! We are the only Aquatic Facility in Western New York to feature the Hydrorider Aqua Spinning bikes! The Hydrorider Aquabike Professional is a unique Aqua Bike or Water Bike made for the activity of Aqua Cycling or Aqua Spinning, taking advantage of the many benefits of the aquatic environment. The resistance is determined by four paddle wheels that are adjustable on three levels. The longer the paddle is pulled out, the greater the surface volume of the water taken in; hence, the greater the resistance. Resistance is also added by increasing RPMs through acceleration which is a key component in aquatic conditioning. Additional challenges can be met by a change in seat positions, intervals or power pull techniques, for maximum results it is recommended to use aqua gym shoes. Hydrospinning is recommended for everyone from tri-athletes, cross trainers, traditional spinners, rehab and weight loss! Ai Chi is a water-based total body strengthening and relaxation progression that integrates mental, physical and spiritual energy. It combines Tai-Chi concepts with Shiatsu and Watsu techniques and is performed in shoulder-deep water using a combination of breathing and slow, broad movements of the arms, legs and torso. The Ai Chi progressions moves from simple breathing, to the incorporation of upper-extremity, trunk, lower-extremity and finally total body involvement. Low impact aerobics, conditioning and abdominal core workout in the shallow end. Walking, stretching, and range of motion exercises for those with joint or other issues. Kick off the new week with a fabulous upbeat Sunday Morning blend of cardio and resistance training using buoyant weights and noodles. Burn calories in the water with this low impact, high resistance aqua spin bike! Registration required – Spaces Limited (at the Member Services Desk). Maximize your cardio training. For experienced exercisers. Limited to 15 participants. One day and two day options available. Registration required. Cardio and resistance training for the upper & lower body. Use water weights and aerobics to tone and burn calories with an ab training. A moderate aerobic workout that concentrates on conditioning using water weights. Moves done suspended in deep or shallow water, with aqua belt. WATERinMOTION® is a pre-choreographed, quarterly-released group aqua exercise program that refreshes your member experience every 3 months with new choreography, music and marketing. With land equivalent intensity, fantastic sing-along quality music, and dynamic instructors, enjoy the pure fun of this hour water extravaganza.